The 2018 school year may be drawing to a close, but we have been working hard on plans for 2019 and beyond, with some exciting news for next year. I am pleased to announce that during 2019, we will commence the construction of a brand new Primary School CLIC and Science block, replacing the current pre-fabricated building. The new Primary School facility will house our Learning Improvement Centre (CLIC), as well as a new Science and Art classroom, offices, storeroom, and new Reception toilets. Work will begin on the site during the school holidays, with the demolition of the old building and site preparation to be well underway by the time school returns for the new year. 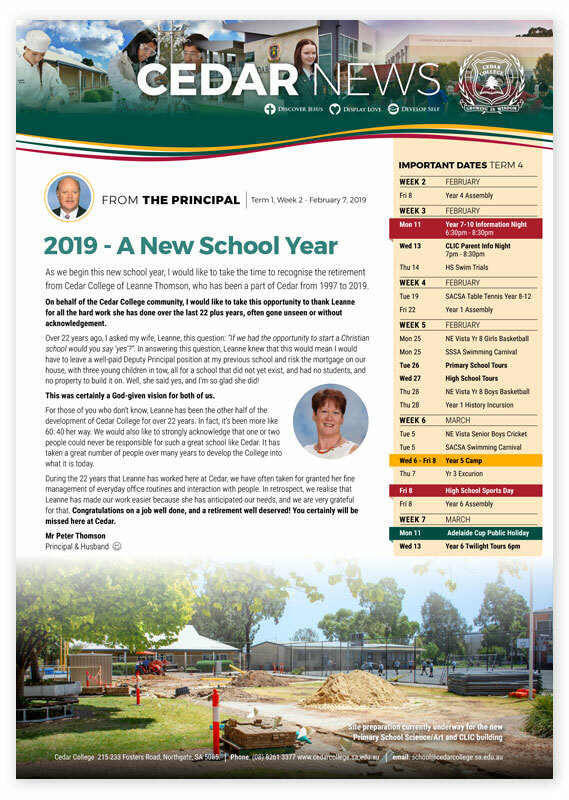 The new foundation is expected to be poured during the April school holidays, with construction to be finished by end of the year, ready for occupation in 2020. All of this activity will, of course, mean some changes taking place for next year. Primary School Science and CLIC will be temporarily relocated to “K-block”, in order for classes to continue while construction on the new building takes place. We anticipate that the Junior Primary Nature Play area will experience minimal impact during construction, and the existing play area will be incorporated into the new building’s design. We’re certainly excited for what is ahead for Cedar College in 2019, but also for the opportunity to wind down, celebrate, and give thanks to God for all that He has done in our school this year. We‘ve already celebrated with the Senior School and Junior Primary families, and look forward to further celebrations with the Middle School and Upper Primary in the days to come. Our prayer, as a school, is that you and your family will enjoy a restful and safe holiday time, and that you would experience the joy of discovering, or rediscovering, Jesus this Christmas time.